Samantha Moog's first job after completing her undergraduate studies was at the National Democratic Institute for International Affairs, and international organization supporting citizen participation and accountability in government worldwide. While Sam connected with some of the values of the organization, she felt disconnected from her work and from the people impacted, sitting behind a desk in Washington, DC. Throughout college, Sam had enjoyed volunteering with the Burmese refugee community in Vermont. Studying abroad also had a lasting impact on Sam, and her previous internship experiences relating to immigration detention and legal advocacy for asylum seekers in the Middle East largely influenced her academic and professional path. Though Sam has long been interested in migration, specifically forced migration and refugee studies, she was not initially drawn to the social work profession until she later found that many jobs she was interested in were looking for an MSW. 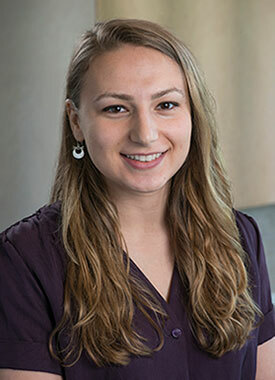 When she decided to attend SSA, Sam chose the clinical track and applied to the Global Social Development Practice Program of Study because of the field placements available in agencies working with refugees in Chicago.